This tour will show you some of the features of URL Manager Pro. 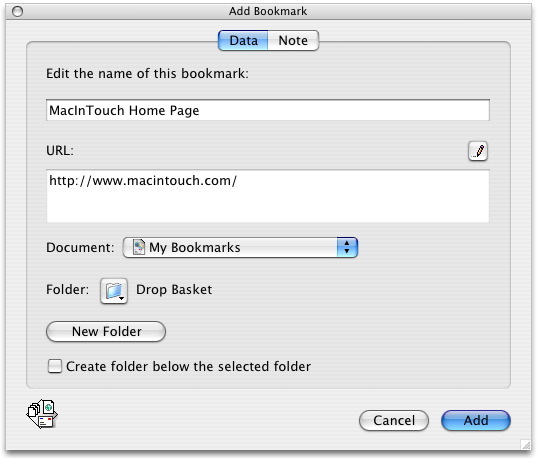 URL Manager Pro's document window shows a hierarchical list of bookmark and bookmark folders. The toolbar of the document window is customizable and URL Manager Pro features the standard Window menu. You can select the screen font via the standard Fonts Panel. You can add notes to bookmarks and while you move the mouse over the clipboard icon, your note is displayed in a tool tip. With URL Manager Pro you can create a number of bookmark files and organize and manage them professionaly. URL Manager Pro defines a central repository of bookmark files for you, called the Cabinet. You place the bookmark files in your Cabinet (which is in your Documents folder) and in URL Manager Pro you then have easy access to them via the Cabinet toolbar item of the toolbar. 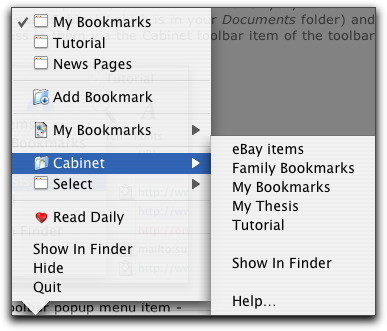 In your browser, you have access to the Cabinet via the Bookmark Menu Extra or Dock Menu. With the Bookmark Menu Extra you have access to your bookmarks from within any application, including your browser. 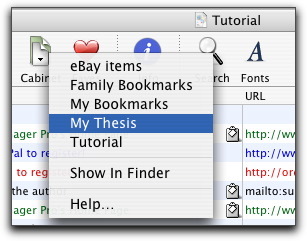 The Bookmark Menu Extra is in the right part of your menu bar, where the sytem menus and 'menulets' are also located. Using the Bookmark Menu Extra, you can add bookmarks, launch bookmarks, open bookmark files and switch between your bookmark files. When you bookmark the current web page, besides editing the name of the bookmark and adding a note, you can specify the destination bookmark file and bookmark folder. When you have selected text on the web page, that text is automatically copied into the note field. Enter the text you want to find in the Search Bar below and you'll get a list of search results. Select a search result and use the Action menu to perform a command on the found bookmark. 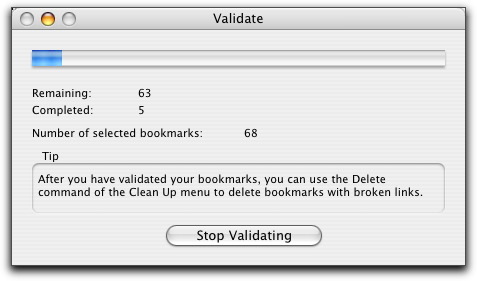 You can validate bookmarks quickly using the Validate command. 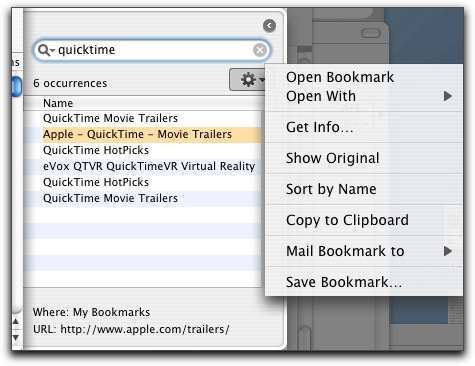 You can also find duplicate bookmarks using the Find Duplicates command. Do you have bookmarks stored in several browsers? 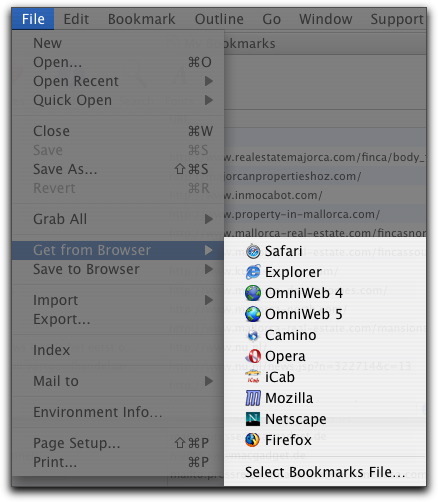 URL Manager Pro can import the bookmark files of Safari, Explorer, OmniWeb, Firefox, Camino, Mozilla, Netscape and iCab. You can also import URLs from TEXT, HTML and XML files and address books from several programs. Do you want to export your bookmarks to another format? Use the Export command to export your bookmarks to HTML, XML or TEXT.